Drake is taking over print this summer. 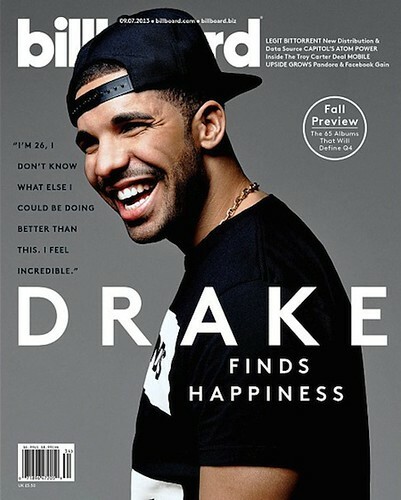 Following covers on GQ and XXL, October’s Very Own cracks a big smile on Billboard’s upcoming fall preview issue. “I’m 26, I don’t know what else I could be doing better than this. I feel incredible” a quote from the Toronto-native that also appears on the cover. His Nothing Was the Same junior effort arrives on September 24. Details revealed so far include features from Jay-Z, Lil’ Wayne, 2 Chainz, his father Dennis Graham, plus production from Noah “40” Shebib, Hudson Mohawke, Hit-Boy, Detail, and DJ Dahi (Kendrick Lamar “Money Trees”). 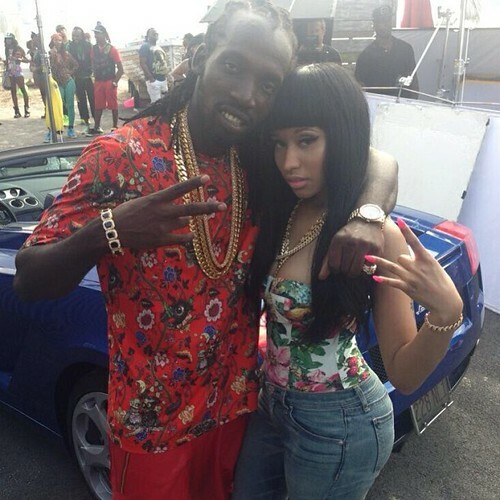 The West Indies invaded Uptown New York City as Mavado filmed the video for his new single, “Give It All to Me.” Featured on the record, Nicki Minaj was spotted on set at La Marina’s Restaurant and Beach Lounge posting for photos and mingling with dancers. The Gully God and DJ Khaled showed their expensive taste in pricey cars, both posing in front of bright colored Lamborghinis. Expect the finish product to debut sometime next month. Check out some early photos below…..
Timbaland’s extensive interview with Revolt TV has already revealed some pretty interesting information, like how Nas, Jay Z and Justin Timberlake recorded a song together, but the latest portion might just be the most exciting. Why? Because the super producer revealed that he’s working on a new posthumous Michael Jackson album. Timbo explaied that Epic Records CEO L.A. Reid approached him with a “big” idea of producing an upcoming MJ project — an opportunity which he jumped at, to say the least. Just like 2010’s Michael, the as-yet-untitled LP will feature unreleased vocals from the King of Pop. The first single will be titled “Chicago” and “sounds like today,” according to Timbo. He also promised that he’ll “have it done by this year,” so could a release date be sooner than later? Coincidentally, today would have been MJ’s 55th birthday. R.I.P. to the King of Pop. Let’s face it, we’re probably definitely never getting a new Tribe album. But in the (nearly impossible) likelihood that you’ve given The Low End Theory, Midnight Marauders and co. as much spins as humanly possible, Toronto producer/MC Rich Kidd has linked up with Denzil Porter and Lord Quest to bless us with some new, Native Tongues-inspired sounds. This ain’t a bad impression at all. 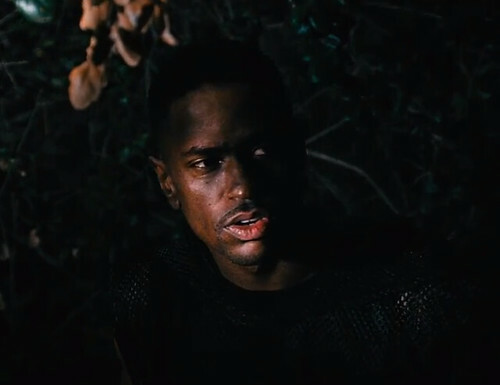 Enjoy the aptly-titled “A Vibe Called Quest” below. You seem to have a complicated relationship with your dad. How are you guys doing these days? He’s on “Jodeci Back,” which would make you think it’s going okay. My dad is a star, that’s what you have to understand. I can call my dad right now and be like, “Yo, dad, I need you to fly to shoot.” He’s always down. I’m living my dad’s dream. My dad wanted to be a famous singer. I have my dad on another bonus record on the album called “Heat Of The Moment.” It’s a real relationship. Not to be ironic, we go through the motions of a father-son relationship. Right now, he happens to be extremely stable and content, and I take care of what I can for him. All he wants to do is go to Beale Street in Memphis and play music. He’s rediscovered his passion for music and for being a musician. Like any other family, there have been dark times. There have been other interviews where I was asked about my dad and I didn’t want to talk about it. And there were records where I didn’t paint my dad as the greatest guy. At the end of the day, my dad knows I love him and that he’s a great friend of mine, but as far as being a father goes, I look forward to being a better father for the children that I have. But at the end of the day, he is a great man and I love him very much. Earlier this year, we saw Party Supplies, who just released his new Tough Love album, kick off Mass Appeal‘s “Rhythm Roulette” series, which challenges producers to make a beat from scratch by sampling three records at random. El-P was the latest up to the plate, and after drawing creative inspiration from his usual vices — beer, weed and cigarettes — the Def Jux wizard proceeded to flip some Beethoven, Theo Vaness and Leon Haywood into a banging, psychedelic beat. Watch the master at work below. Riff Raff may still be coming after him but James Franco has bigger things to deal with. Currently, he’s working on a film adaptation of the 1973 novel Child of God, written by Cormac McCarthy. The story follows the main character Lester Ballard, a twisted necrophiliac who eventually becomes an outcast of society and moves into caves. He turns to serial killing to fulfill his sick urges. The movie premieres this week in Venice and will also air at the upcoming Toronto film festival. Franco, Jim Parrack, and Tim Blake Nelson also star in the movie. Resuming where they left off in “My Songs Know What You Did In The Dark (Light ‘Em Up)” starring 2 Chainz, Fall Out Boy are on the run with Big Sean in “The Mighty Fall.” After being trapped in a blazing van, the band run for their lives as they’re chased by a gang of murderous teens. Fall Out Boy’s Save Rock N Roll album is out now on iTunes. Watch “The Mighty Fall” below….. Despite the fact that her show aired one of Kanye’s most revealing interviews to date, Fox has cancelled Kris Jenner’s talk show. According to Radaronline, “Kris” will not be returning for a second season. Apparently, the show’s overall ratings just weren’t strong enough to bring back more Kris. “Kris did get a ratings bump for her last show when Kanye West revealed the first baby pic of daughter, North West, with Kim, but that was a one time shot in the arm and it wouldn’t be indicative of what the ratings trend would be,” the source close to the production told RadarOnline.com.